The Picnic at Ascot Wine Purse in London Plaid is a one of a kind wine carrier that double as a clutch or evening cocktail purse. 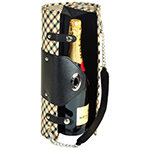 Great for parties and nights out on the town, this attractive hard sided purses safely carry one bottle of wine or champagne. Features a padded interior with attractive lining and a small inside pocket to neatly carry the included corkscrew. High end design details and construction make this an excellent fit for any occasion.